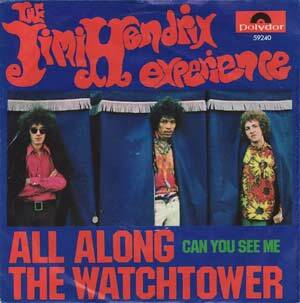 All Along The Watchtower is an excellent showcase of Jimi Hendrix’s tone and use of effects. A lot of people have asked me about the effects on this song so I’ve made this short guide to go through the tone used throughout and the effects. 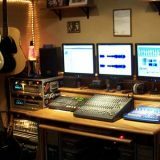 If you are keen to learn the song or are wondering what type of effects he used on that song, this guide is for you. We will go through the main sections of the song and break down the effects used so you can recreate them using your own pedals. Be sure to check out my comprehensive guide on Jimi Hendrix’s tone, gear and effects as Jimi used more effects than what is covered here. It may seem like a minor point to make, but the tuning of this song does play a part in the way it sounds. Of course you can definitely play the song in standard tuning, but it’s not going to give you the same feeling as playing it half a step lower. I recommend tuning your guitar down to get a feel for playing in Eb. Then you can search for “All Along The Watchtower backing tracks” in YouTube and play along with the ones also in Eb. It’s only a half-step difference, but if you want to get that Hendrix vibe, it does make a difference. The rhythm guitar you hear in the beginning is a 12 string acoustic performed by Dave Mason. The 12 string is a key part of what makes All Along The Watchtower so distinctive. You will notice if you play the chords on a regular 6 string it just doesn’t have the right feel to it. If you’re unfamiliar with 12 string guitars, they basically a regular 6 string and double up each string. The high E and B strings each have an extra string at the same pitch. 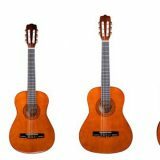 The G, D, A & low E strings are doubled each with a string one octave higher. 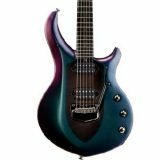 This means if you know how to play a 6 string guitar, you will be able to easily pick up and play a 12 string guitar. 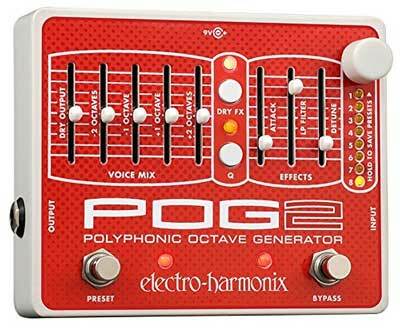 If you like the sound of a 12 string guitar but can’t justify buying one, a simple way to achieve a similar sound is to use a pitch pedal such as the EHX POG 2 to harmonize up an octave. It may not be quite the same as playing a real 12 string guitar, but it does get you close enough. I won’t explain how Jimi got his lead tone as I covered it thoroughly in my Jimi Hendrix guide. So check that guide out for details on how to set up a good lead tone. Listen to the lead playing during the verse (0:18) and compare it to the lead you hear during the intro (0:09). What you will notice is that the verse lead tone is much quieter. Not only is it quieter, it is cleaner. To achieve this softer tone, don’t switch to a clean setting. Keep your lead tone and roll your guitar’s volume knob down when you get into the verse. As you roll your volume knob down, you will hear the tone clear up which is exactly how Jimi produced his cleaner tones live. When you get to the next lead section (0:52), all you need to do is roll your volume all the way back up and you bring back that full lead tone. Later in the song you will hear heavy use of delay. It’s a key part of one of the solo sections. So if you only have one delay pedal, you will have to keep it off during the rest of the song so you can use it properly during the solo. But if you have multiple delay pedal, or you have a delay pedal with easily accessible presets, I recommend adding some delay to your lead tone. If you listen closely, you can hear some delay trails during lead licks. Use delay as a way to smooth out your lead tone. To do this, keep a fairly low feedback level so the delay is barely noticeable while playing. Most of the song has a very mellow lead tone. A neck or middle pickup would produce the best results depending on your guitar. But think about how you would like your tone to change for the different sections of the song. For example, you might want to use your middle pickup during the verse then switch to the neck pickup during lead breaks. On most guitars this will keep the verse mellow and give a bit more power to the lead sections. There is also a section where it you hear a sharper, thinner and harsher tone at 2:33. To achieve this tone, simply switch to your bridge pickup. A common mistake beginners make is to use too much gain. The lead tone used in the song is actually fairly clean so try to avoid over-saturating your tone with distortion or overdrive. If you add too much gain, you lose definition and clarity in your licks – something that makes this song really shine. At 1:59 up until 2:33, you will hear a really trippy effect that screams that Hendrix psychedelic vibe. It’s quite easy (and fun) to reproduce this tone if you have the right gear. I’m not going to speculate on what Hendrix actually used for the slide as I’ve heard people suggest everything from a Zippo lighter to his microphone stand. It really doesn’t matter what he used because any slide will produce essentially the same tone. With slides, you have the choice between glass, steel or brass. Each produces different tones and feel different so it depends on what you like. If you like a mellow sound a glass slide will probably suit you. If you like a metallic sound a steel or brass one will do. Slides are cheap so grab one of each and get a feel for them. When you play this section with the slide, try to avoid making any noise with the slide (eg: hitting the slide against the strings). Any noise you make will get picked up by the delay and repeated which will take away from the silky-smooth sound you hear in the song. Aim for really clean playing and you’ll enjoy the results. The other key part of what you hear in this section is a heavy use of delay. You can use essentially any delay pedal with the mix cranked up. The goal is to create a wash of delay to give that trippy vibe. 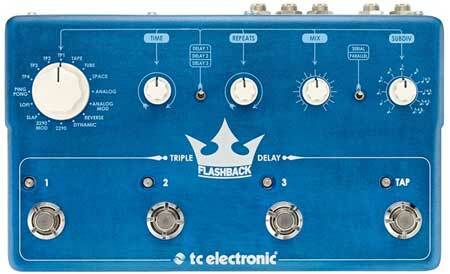 If you don’t have a delay pedal, a good choice if you’re interested in experimenting with extreme uses of delay is the Flashback Triple Delay by TC Electronic. It’s essentially three delay pedals built into one which allows you to come up with interesting mixes of different delay settings at the same time. 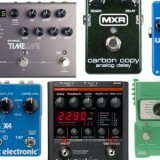 Alternatively, check out my guide on Best Delay Pedals here. You may also want to experiment with mixing some reverb in along with the delay. The reverb will help round out the delay and give a smoother flow to your playing. While you can definitely achieve the effect in the song only with delay, adding some reverb in does seem to emphasize the way the notes glide around. 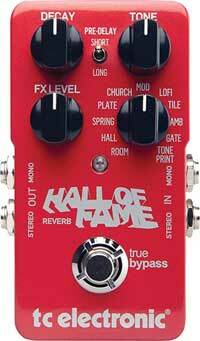 The Hall of Fame Reverb by TC Electronic is one of the most popular reverb pedals if you don’t already have one. While you can use your guitar amp’s reverb (if it has any), a pedal is a better choice because it allows you to turn it on and off when needed rather than being on the entire time. That allows you to experiment with reverb as an effect rather than an always-on component of your tone. Check out my guide on the Best Reverb Pedals here for more ideas. After the trippy slide section, you hear Jimi rock out with his wah pedal. 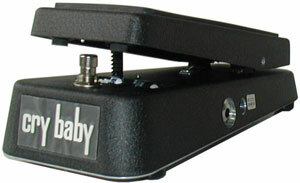 The wah is an iconic part of the Jimi Hendrix tone so if you don’t already have a wah pedal, it’s worth getting one. The wah section in All Along The Watchtower is quite short, but the wah does really add to the feel of the solo. It’s a great example of how Hendrix used the wah because you will notice a change in the style of playing during the wah section. There’s a clear difference in the style of licks played during the wah section and immediately after. There are plenty of options when it comes to wahs for you to choose from. I go through different wah pedal options in my Hendrix guide so check it out for Hendrix related wah pedals. While there is a signature Jimi Hendrix Dunlop Wah, I feel you’re probably going to be happier with either the Original Crybaby or a Vox V847A as they’re a lot cheaper and both sound great. If you do get a wah pedal, you’ll then be able to enjoy jamming with other Hendrix songs that make use of the wah such as Voodoo Child (Slight Return). Delay plays a big role in making the final lead ring out so powerfully. If you play it without any delay, it will likely feel a bit weak depending on how your pickups and how you pick the bends. By adding a delay with a good feedback setting, it feels and sounds far better. Experiment with different feedback and mix settings. What you want to try and do is keep the feedback high (so you get a decent number of repetitions in the delay) while keeping the mix low enough that you can still clearly hear the original part. You don’t want your original part to be completely drowned out by the feedback or you lose all definition in your playing. Of course, there is no right or wrong when it comes to experimenting with effects, so crank the mix-up and see if you like it. You may prefer hearing how the feedback overrides your original playing. 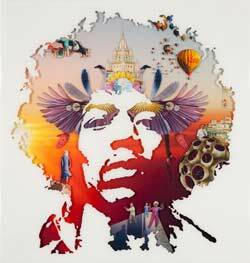 As I explained in my Hendrix guide, experimenting with effects is partly what made Hendrix so good. So any time you set up some effects, try experimenting and break all the rules to see what interesting sounds you can come up with. What other effects could you add into this song and how could those effects change the feel of the solo or other parts? This is likely the type of thinking Jimi had when he first considered covering this song. Experimenting with effects is a great way to learn what works and what doesn’t and why. Then you can take what you learned to your own songs and ideas. For example, what if you add in a slow phaser during the end lead section? How would that phaser sound along with the delay pedal and the repeated picking of those bends? When I tried this, it inspired me so much that I started writing a new song with this idea. That’s the goal here – try something new out and see where it leads you. Listen closely to the lead throughout the song and you should notice how clear the playing is. The gain is low enough that you can clearly hear each note. This is very different to other Hendrix songs where the fuzz distortion can wash out his playing. When you play this song, do you hear the same clarity? Or is the gain too high, delay too high or something else washing your playing out? If you play this song in standard tuning, then play it in Eb, it can be surprising how different the two versions feel. Dropping the tuning down a half step can really change the way you think about the licks you play and your tone. Taking this further, what other tunings could you experiment with and how does each tuning affect the way you play? If you have never experimented with lower tunings before, take this song as a starting point and see how far you can take it. You’ll find that licks and riffs not only sound different in a lower tuning, but feel different as well. When the slide section starts, you hear a complete shift in the way Hendrix plays. He uses the slide and plays very simple parts to allow the delay to shine. Then when the wah section kicks in, you hear him change styles again. The licks he plays suit the wah. Then when he switches the wah off, again his style of playing changes. This is an important point because sometimes people only use effects to enhance their playing. It’s also a good practice to really try and change the way you play to suit the effects you use. Next time you jam with some effects, think about how you can change your playing to suit each effect. If you haven’t heard the original version of All Along The Watchtower by Bob Dylan, have a listen to it. It feels like a completely different song. Hendrix took the song and changed it to give it his own style. That’s what makes this song so powerful. Now think about what you do when you play somebody else’s song. While there’s nothing wrong with playing it exactly as the original, it’s a good idea to try and come up with your own version of it. Think about how you could change this song (or any other) and add your own style to it. What could you change about the song, what effects, what tone, what licks to make it your own version? If you want to learn more about Jimi Hendrix’s gear, effects and tone read through my thorough guide on Hendrix. I dig a lot deeper into his live rig as well as how to try and experiment with your gear like Hendrix. If you liked this guide and want to see more guides on specific songs, please let me know here. My focus is to write guides on effects-heavy songs so if there’s a song filled with effects you want to learn more about, let me know. To get notified of any new guides on Hendrix, effects or other songs, subscribe for email updates.